Is inbound marketing working for you? If not, hate to break it to you, but the problem may be your talent. Maybe the individuals you're hiring don't have the qualifications to help your company grow -- or perhaps they aren't a good culture fit. 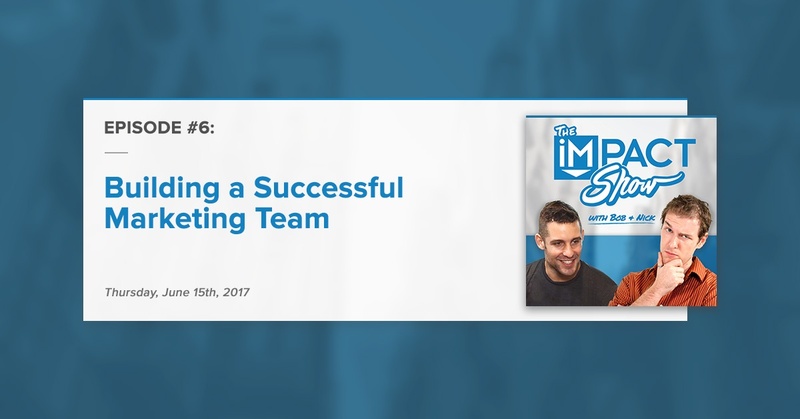 This week, Bob and Nick took to Facebook Live to not only discuss how you can build a successful marketing team with these factors in mind, but they also mentioned Wistia's new tool Soapbox, tips we took away from HubSpot's Sales Training, and why you should attend IMPACT Live. Just in case you missed us live (or if you want to relive the magic), you’ll find the episode’s show notes below as well as the recording. Enjoy and make sure to share with your peers! A two-day event in Hartford, CT on August 1-2nd, 2017. An intimate group of experienced, dedicated marketing and sales leaders. Here's a look at why we're hosting IMPACT Live. NEW LOWER PRICING: We want you to go and, we don't want pricing to be the hurdle stopping you so now you can get your general admission ticket for just $999 or VIP access for $1399. Speakers include Marcus Sheridan, Tara Robertson, Mike Volpe, Mark Roberge, George B Thomas, Paul Roetzer, and more. Get your ticket here now. Soapbox is a free Chrome extension that enables anyone to record, edit, and share high-quality videos in minutes. As a company, it's important to have one thing that's very buzz worthy in your marketing. HubSpot has the marketing grader and for Wistia, it's Soapbox. Similar to Facebook Messages, from mobile apps, users can have chat communication and the person on the other side who receives the message will get an iMessage. We're worried about how many platforms there's going to be, to message a company. Everyone has a Facebook page and your audience will get used to messaging a company through there and as more and more channels open up, it can be hard for a company to manage all of those channels. If you're trying to get your own team to adopt inbound practices, remember the earlier you start the transition to Inbound, the more you'll yield. It's important to understand the emotional reasons for delay (it's a big leap). Inertia: It’s a pretty big leap. If we don’t bring in organic leads, they don’t get fired. What happens if someone's searching for us today and we don't show up? You don't get the lead. Where do they go...? Possibly your competitors. Personal Risk: It could be a career defining move if it does succeed. But if it fails, it's possible they're career can be threatened. Company and Political Risk: Marketing is often starting the convo in the corporate doghouse because they either don’t produce enough leads or too many of low quality. Sales guys might not embrace because of short-term thinking or fear of job security and/or loss of control. People Don't Understand the Pace of Inbound: It takes some time and every week counts. Don't ask, when do you want the project to start, but when do you want customers by? For smaller companies who can't afford to have someone monitor and reach out to leads in real time, what can they do to manage a rapid response time? Identify priorities. If you're not doing what it takes or setting up the process for responding to leads, you're flushing your marketing dollars down the drain. That's something you'll need to solve for. Get creative. What can you do to respond to those in a rapid way? In a human to human way (as quickly as possible) before they move on to your competitor's website. Don't be afraid to send out automated emails, that will set expectations. But, what would you do if you were looking for a service organization? Would you fill out a form and just wait, or would you eventually move on? And, what would you expect? A lot of people say, "Inbound Marketing Doesn't Work!" Nothing was remarkable, nothing stands out. There was nothing similar to HubSpot's Marketing Grader or Wistia's Soapbox that would capture the attention of visitors. After looking over your marketing you'll want to ask, "why did that happen?" It always comes down to people. Mentioned by Mike Volpe in a Seeking Wisdom podcast. when you think about a marketing program, there's no traction and you're not driving new people to your webiste, in every situation you'll find that the people hired to do the marketing weren't qualified to do the job The individuals you're hiring don't have ideas, strategy, or a real plan. It's the same old, same old. Hire for Culture and Skills: Have to be a culture fit for the organization (do they share the same core values, do they see themselves in the companies vision) and on top of that do they have the skills to do the job. Make Sure They Can Do the Job Before You Hire Them: During the interviews try to simulate activities they would be doing everyday on the job. As an agency, we do a role play with various situations that we go through. Don't be afraid to give them an activity to complete between various parts of the interview process. Always Be Recruiting: Talk to hundreds of people, before your hire (maybe hundreds is an exaggeration). If you're not getting enough applicants in your pipeline, go to networking events, check out your competitor's career pages, and do whatever it takes to get people interested in working at your company. Don't Delegate Hiring Decisions: Have someone that project manages the entire process, and ensure that your team is involved, but at the end of the day, if you're in charge you should have the ultimate decision. Understand What Helps Them See Their Future at the Company and Make That Happen: People want to know what their future/career path looks like before working with a company. Find out what's important to the candidates and members of your team that will make you successful. Need to Fire Poor Performers: Can't keep around the types of people that aren't representative of the type of employees you're looking for. If you're not firing poor performers you'll run the risk of lowering morale and may force your A players to find new job opportunities. For a small firm (30 people or so), that has never had a true marketing team, what do you think the right size should be on the marketing team? We are looking at really having a "smarketing" team of 2. Someone who can bring good ideas to the table (3-5 years of experience), great writer, knows digital marketing and knows how to use the tools. If you throw something at them, they can figure it out. Could outsource design and development. Could assist with marketing work, but would primarily assist in organizing contacts and calling inbound leads and setting up appointments for your sales rep.
Get your tickets to IMPACT Live 2017 to meet David Meerman Scott, Mark Roberge, Marcus Sheridan, and dozens of other experts in-person this August! We would love your comments! Feel free to send us an email or comment on the Facebook thread. We'll be back again next Thursday, June 22nd at 1:00 PM ET. Want to get reminded? Drop us your name and email address below and we’ll make sure you’re notified before the broadcast every Thursday!